Home > New Song Listing > What Will Happen to our Daughters? Losing women’s rights and equal pay? Of progress if the GOP should get its way. Take away your freedom and health care. Things have changed. It’s not morality. They will do anything for money, so beware. You don’t really have a vote if you don’t use it. This time around, you could really lose it. And our future should be together. I really hope that you will put your hand in mine. Otherwise, what happens to our daughters? Think of what might happen to our daughters..
WHAT’S THIS SONG ABOUT? After a century of progress in Women’s Rights in the United States, we have made an abrupt U-turn in the past two years. Starting in 2011, there has been a dramatic escalation in state and federal legislation to limit women’s access to healthcare, including birth control and reproductive rights in general. At a time when human population exceeds 7 billion, and we are facing prospects of increasing resource wars over food, water and energy, our highly polarized political system has diverted our attention away from crucial issues of climate change, energy policy and social equity, and focused instead on emotionally-laden conflict over women’s rights over their own bodies. Do not be fooled. Although some aspects of women’s rights do indeed call for careful thought and discussion, the issue itself is being used shamelessly by wealthy and powerful political and economic interests, as a smokescreen to keep our public eye off the ball. As long as we, the people, are arguing about emotionally-laden issues, we can’t concentrate on how Corporate America and Wall Street, by controlling Congress and the media, are robbing us all blind as they destroy our natural world and our society. As I was working on a YouTube presentation of this song, it struck me that in recent decades there have been few high-profile American men who really have embodied the deep currents of American moral fiber that figure so strongly in our national heritage. Yet, I found so many of “America’s Daughters” who have been fierce, strong and capable vessels for this deep power and commitment. 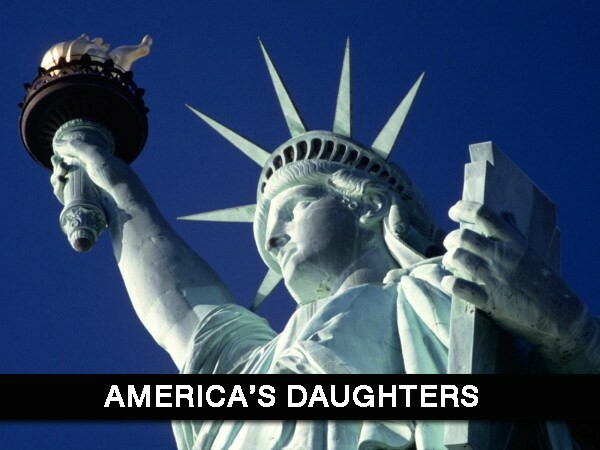 May we all be inspired by America’s Daughters to awaken from this trance of greed and reclaim what we have forgotten! I want to take your music with me as I travel. It is inspiring, especially the messages your songs give. Everyone needs to hear these things and make decisions based on morality NOT money! Great music! Thank you for creating this powerful musical message. I am sending it to all my friends, women and men – some will be upset, and others will send it along. This is too critical a time for us to let it go by without standing up for our daughters, granddaughters and all women everywhere. Bless you for doing this!